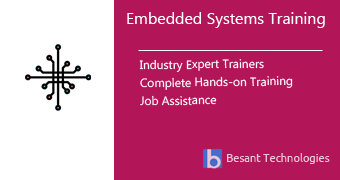 Besant Technologies takes pride in stating that it offers the best Embedded System	Training in Chennai. What make our course even more valuable are the faculty members that impart the lessons; they are expert professionals and have tremendous theoretical and empirical knowledge. The instructors have years of experience of working in MNCs, dealing in Embedded System and related technologies. What sets us apart is the fact that we offer Embedded System Training in Chennai in a practical manner, as per industry needs and standards. The range of services provided by our esteemed team of trainers includes Embedded System Corporate Training services, Embedded System Online Training as well as Embedded System in Classroom training. Our syllabus has been designed in a way to meet real world requirements, not just to suit the beginner level students but also for those looking to receive advanced level training. The training that we provide is also very flexible in that it is made available on weekdays as well as weekends based on the demand and convenience of the candidates. Since, we are focused on imparting a One-to-One Embedded System Training in Chennai, our trainees get to acquire a lot from the course. Our Fast-Track Embedded System Training in Chennai also ensures that they learn the most within the least possible time. Here are the major topics we cover under this Embedded Systems course Syllabus Embedded Basics, Specific Processor Architectures (or) Controllers, Embedded Application Development, Linux kernel, Advance C Programming Embedded Linux system development, Device drivers, Buffer allocation Memory Mapping and DMA Rtos. Every topic will be covered in mostly practical way with examples. BDreamz Global Solutions Private Limited (Owner of Besant Technologies® Brand) is the unique Authorised Oracle Partner, Authorised Microsoft Partner, Authorised Pearson Vue Exam Center, Authorised PSI Exam Center. Here are the Embedded System Training Classes in Chennai Schedule in our branches. If this schedule doesn't match please let us know. We will try to arrange appropriate timings based on your interest. What is an Embedded Systems? What are the Embedded Applications and Functions? What are the Embedded Design constraints? What the components of Embedded Hardware and Software? What the Building block of embedded project? What are the Hardware and Software Embedded Tools? What is Microcontroller & Microprocessors? What Are The Various Modes Of Training That Besan Technologies Offers? Besant Technologies basically offers the Class room training and online instructor-led training. Apart from that we also provide corporate training for enterprises. What Kind Of Projects Will I Be Working On As Part Of The Training? We provide you with the opportunity to work on real world projects wherein you can apply your knowledge and skills that you acquired through our training. We have multiple projects that thoroughly test your skills and knowledge of various components making you perfectly industry-ready. The Besant Technologies projects are equivalent to six months of relevant experience in the corporate world. Our Besant Technologies Chennai Reviews are listed here. Reviews of our students who completed their training with us and left their reviews in public portals and our primary website of Besant Technologies & Video Reviews. Faculty is very friendly and will go above and beyond to help out. The trainer Ram is very knowledgeable and has good industry practice. Overall a great experience!.. Besant Technologies offers placement opportunities as add-on to every student / professional who completed our classroom or online training. Some of our students are working in these companies listed below. We have separate students portals for placement, here you will get all the interview schedules and also we notify you through Emails. Our team of instructors are industry experts with more than ten years of training experience. Mentors train Embedded System in Chennai not only to assist students in implementing live projects, but also to hold a preparatory session for the interview along with community outreach. Besant Technologies branches in Chennai are listed here. And most popular locations where students / professionals are lining up to get trained with us. Besant Technologies branches in Chennai are listed above. And most popular locations where students / professionals are in just few Kilometers away from below mentioned locations lining up to get Embedded System training with us.